Dare's 'Tribes Install Thread and Troubleshooting and INTERPOLATE' thread is very useful but its a little hard to follow and has a lot of old/dead links. So i'm making a new one - but its a work in progress, i'll add stuff and fill out missing parts over time. I'll probably remember my own stuff best - so feel free to point out other stuff that you guys think should be included. Last edited by Groove; 12-18-2018 at 22:49..
1) Does Tribes 1 work with Windows Vista/7/8/10? 3) Do i need to use a 'modern' build of Tribes, or can i use my old config? - you can use whatever you want. afaik no servers enforce any kind of client-version requirement. some servers may show 1.41 'afterhope' users, and scan them for cheats to prove you're a 'clean' player, but its not required. - however, modern configs may run better on modern systems - try one out, you might like it! 4) I can load up Tribes, and my mouse works fine, but I dont see any game servers? whats up? - you probably have old/dead master servers. 5) What are 'plugins'? How do i use them? we load plugins with another .dll we usually refer to as the 'pluginloader', made by NoFiX. this 'pluginloader' is called 'rasadhlp.dll' and is placed in the /Tribes folder with the .exe. older versions of rasadhlp.dll load plugins manually by adding switches to your Tribes.exe shortcut. newer versions automatically load all .dlls stored in /plugins. 6) What is 'scriptGL' and how are scriptGL configs different? 7) What is 'interpolate' or 'NetSet' ? is it legal/acceptable? - yes, currently interpolate or 'netset' is 'legal' and 'acceptable' - if you want to use it, use it. - 'interpolate' and 'predictforwardtime' were controversial netcode-related settings that determine how much Tribes interpolates data between known points (leading to 'smoother' player movement) and how much Tribes tries to predict where players will be. Changing these settings from stock became viewed as a cheat, so community patches like 1.30 locked these variables. later, 1.40 was released, which had a new method of prediction - it uses your ping to dynamically determine what the 'best' net-settings are. Some people don't like these values and wanted to change them again - so NoFiX made the 'NetSet' plugin, which once again allows end-users to set their own netsettings manually. 8) When i start Tribes, i can't move my mouse/the window is flickering! -you may have windows text scaling set higher than 100%. to fix this issue for Tribes only (without having to go make all fonts small again), right-click Tribes.exe and then click Properties. 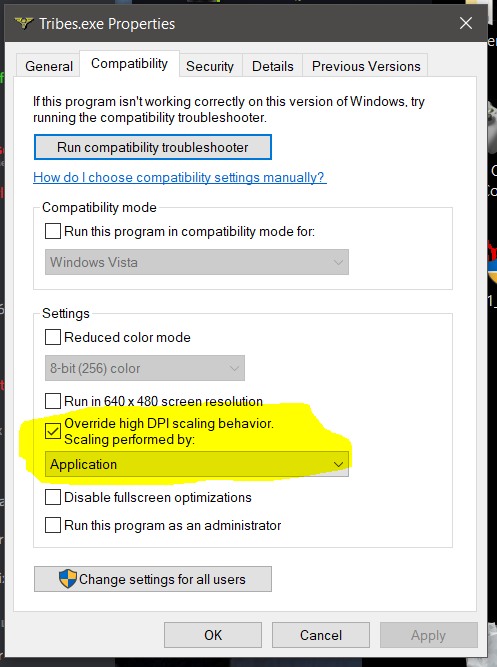 On the Compatibility tab, select Disable Display Scaling On High DPI Settings, and then click OK. You can also try checking off 'Run this program in compatibility mode for: Windows XP Service Pack 2'. If both those fail, try setting fonts back to 100% in your display settings (?). T1 Base, Insomniax, Renegades and Shifter servers now online. T1 Ladders coming soon (hopefully completed in January). Match play expected to start in January as well. Last edited by -defiance; 12-23-2017 at 05:03..
Hey Groove do you still recommend your 2017 Tribes download, or have you changed a lot since then? could you link to 1.41 somewhere directly in this thread? i just reinstalled and it's harder to find than you'd think. someone not looking for it explicitly would never know it existed much less where to get it. Last edited by rotochop; 08-10-2018 at 09:21..
funny thing you should say that because dis my tribe dl dare tribes by pancake your config is 1.48GB big, out of which 1.37GB are voicepacks. my 3 'basic' configs and the grey config (the ones i personally recommend when asked) have very minimal scripting, barely anything more than a stock config and sometimes even less. and im more than glad to add anything that people suggest, so if you have specific things you want changed or added, as i said just paste me what you want in there and i'll do it but i haven't played T1 in like 2+ years so dont expect me to proactively write new content or essays about the best netsettings etc (even tho ive probably spend 2-5 hours every week for the last 10 years helping people with netset - its literally the most common question i get and the vast majority of people are using completely broken settings). but i'd be glad to paste in whatever you or anyone else writes on whatever topic that you think would be helpful to new players. feel free to write new FAQ's or long detailed explanations of things and i'll put them wherever you want them. Last edited by Groove; 08-10-2018 at 13:10.. If that isn't dare it is prob one of the SA members he warned us about. We should ban these accounts according to dare.